Blood pressure (BP) is the amount of pressure exerted by the flowing blood upon the walls of the arteries. The normal value is around 120/80 mmHg. Your blood pressure value is considered as hypertension when constantly there is a blood pressure of more than 140/90 mmHg. It is diagnosed by checking the blood pressure serially, at the clinic or home, preferably twice a day, and noting down the readings for seven days. A family history of hypertension. Increased salt intake in the diet. Diabetes and other metabolic syndromes. Primary hypertension: where the high blood pressure does not have a secondary cause. About 95 % of the cases diagnosed with hypertension are of this type. Secondary hypertension: when the blood pressure is high due to diseases of the kidney, adrenal glands, thyroid glands, tumors, hormonal abnormalities, too much of salt intake, alcohol consumption, other medications, etc., it is known as the secondary type. A list of routine workups that assess your organ status. Check your BP regularly. You can buy a digital BP monitor and check your BP on the go. Check your ECG (electrocardiogram) and get a 2D echocardiogram done to monitor your heart function. Do renal function tests to check the functioning of the kidneys. Check for blood glucose levels to know your level of diabetes risk. Get a lipid profile done to check cholesterol levels and to prevent secondary heart problems. Here is what you must do to prevent complications in the future. Frequent monitoring of your BP. Decreased salt intake in the diet. Increased potassium intake in the form of fruits and vegetables. Regularly taking medications for lowering the BP as prescribed by your physician. Eat healthy foods such as fresh fruits and vegetables. Do meditation, yoga, and breathing exercises. 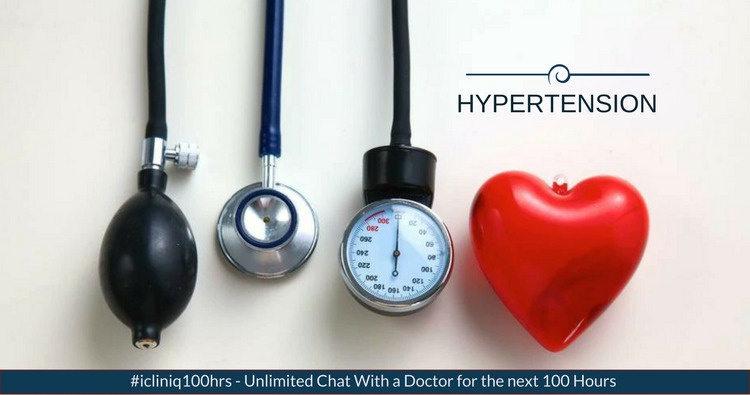 Do you have a question on Hypertension or Meditation?